I discovered Ramsay years ago, but my true love affair began in the Summer of 2012 when I came across the British version of Kitchen Nightmares on Netflix. Needless to say, I burnt through the entire thing in a couple weeks. What drew me to it? Well, the biggest thing was Chef Ramsay himself. His no-nonsense personality coupled with his keen business sense and talent for showmanship really made the series a joy to watch. Besides Ramsay himself, I enjoyed Kitchen Nightmares because everyone likes to see failures turn into successes. It's almost human nature (e.g. Rocky and a bunch of other underdog stories). I don't know, maybe I like Ramsay because he comes across as incredibly genuine, at least in the British versions of his shows. Despite his tough exterior and drill sergeant mentality, he really seems like a guy who wants to help people, rather than viciously pile-drive them into the ground as most would believe. The Ramsay that you see on American TV is a bit of a caricature, to be sure, but even that version is better than most of what you'll find on the Food Network. Don't get me wrong, the Food Network has some good shows, like Chopped, Iron Chef, and Restaurant Impossible (which is just a watered down version of Kitchen Nightmares, with more of a focus on HGTV style redesigns of restaurants anyways). However, their personalities are a bit, well, lacking. I mean, when Guy Fieri is one of your headliners that's a bit of an issue. The dude started out strong (I watched his rise to prominence after he won "Next Food Network Star") but has since turned into what I like to call the "Billy Mays" of the Food Network, in that he yells all of the time and raves about stuff that really isn't as good as advertised. I would know, as I once went to a Guy Fieri approved restaurant and got the thing he recommended, only to find that it was pretty terrible, especially compared to how he portrayed in on TV with all the guffawing and pleasure induced spastic body tremors. That restaurant was the Santa Cruz Diner by the way, in case you're curious. Anyways, who else do they have besides Guy? Bobby Flay? Rachel Ray? Giada? Yup, they're alright, but they're all a bit bland in comparison to Chef Ramsay. Well, maybe bland isn't the word. Maybe it's the fact that they don't have British accents that does it for me. They do have that Barefoot Contessa lady, but honestly who wants to think of food and bare feet at the same time? I know I don't. Plus, she seems like the type who would slap you with a rusty spatula if you didn't like her food. 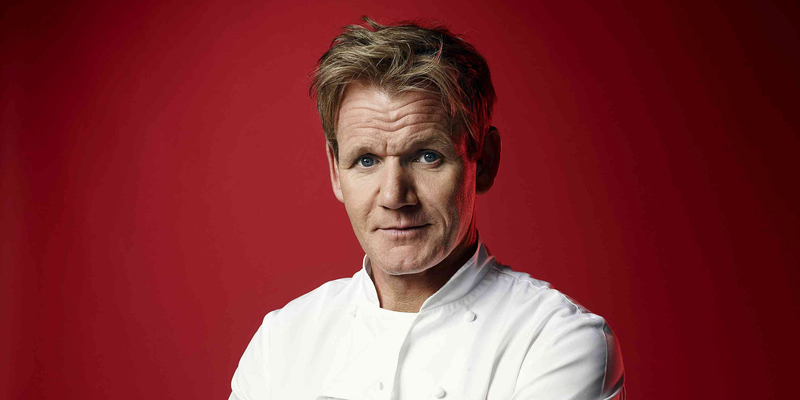 If there was a system by which we ranked TV Chefs, I'd put Ramsay near the top. Food Network headliners would be several pegs below him. Then, the rest of the drivel filling out the hours on that channel would go way way below even that. Have you ever seen one of the Food Network's other shows? And by other, I meant the ones starring those no-names you've never heard of. It might as well be public access TV. Sure, they're usually decent looking, and they can talk to a camera and cook, but it's all so soulless. They all follow the same format of using colorful foods, weird overly bright kitchens, and strange elevator music that plays when stuff is chopped or ground or mixed together. To top it all off (it's a pun, get it) they're usually hosted by someone equipped with dead eyes, who peers out from their cookie cutter show right into your poor defenseless soul. Other tropes include: ending the show with a scene where the cook gets together with their creepy family and you have to watch them all eat, or having to witness the "star" of the show do something uncomfortably embarrassing, like sing to their guests while they nervously pick at their food (I'm serious, that happened). Then, almost one hundred percent of the time, the host will end the show by looking at the camera and saying something like "there ya have it folks, a simple meal you can cook in X amount of time, Y amount of days of the year, for your own personal family of serial killers!" Then they wink or do something else cutesy and the next copy/pasted show comes on. This is an issue especially on Sundays, where the Food Network schedules all of the shows for the winners of their culinary version of American Idol. That is theday where careers go to die. I almost feel bad for "Next Food Network Star" winners because, besides Fieri, they've all pretty much died a slow death of asphyxiation as a result of the Sunday morning time slot. Seriously Food Network, do a better job of promoting these people! You need more talent, not more Fieri! So what can we take away here? Gordon Ramsay is great because he seems to be an actual living breathing human who hosts a number of highly varied food-related shows. While his US persona can get a bit hackneyed, overall he's far more personable and relatable than the horde of cookie cutter chefs inhabiting the Food Network's airwaves. Watching his stuff permanently jaded me to the Guy Fieris and Rachel Rays of the world, not to mention all of the other lesser stars in the realm of TV food. I'll end this with a bit of free business advice for the Food Network: hire people with souls! It can't hurt right? Seriously, one guy on a show this morning looked like the ashen spawn of a thousand year old soulless zombie fresh from the mind of H.P. Lovecraft. The food looked appetizing, but who wants to eat something made by robotic automatons/creepy Stepford Wives? Not me! Well, unless I'm hungry. Ok, that's all for now, see all you awesome folks later!